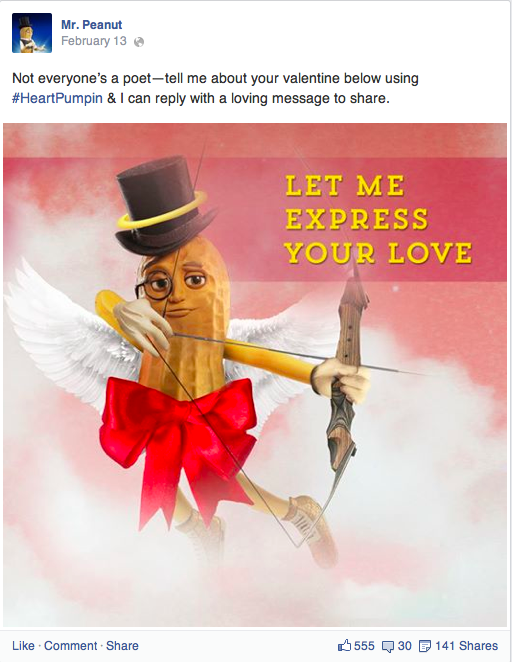 Two days before Valentine's Day 2014, Planters Peanuts asked for a social activation that would let Mr. Peanut show the love and simultaneously promote the heart health of Planters Peanuts. And cost approximately 0 dollars. Our solution was to play on just how hard it is for people to express their love, as we made Mr. Peanut into Cyrano de Bergerac. People shared a few details about their loved ones on social using #HeartPumpin in return for a custom-written video e-card straight from Mr. P., each delivered within four hours. People began posting info about their sweethearts within minutes, and in just 48 hours, we created over 100 unique videos for wives, husbands, girlfriends, boyrfriends, unrequited crushes, pets, grandkids, random celebrities—even loved ones going into surgery. Response to submission: "I love my forever valentine." Response to:"He's a man, has 2 legs, 2 arms, 2 eyes, and 2 ears..."
Response to: "My Honeyschnookums is awesome." Response to: "I I am madly in love with My Valentine Tre, He makes me laugh and is my best friend and always up for an adventure. He loves James Bond Movies and Frank Sinatra and really I am just crazy about him. He gets my #HeartPumpin"
We also created sensual Mr. Peanut posts for Twitter and Facebook to drive people wild with desire...for video e-cards.